Here’s how it all came about: it was last Friday, and we were trying to avoid Charles and Camilla. They are apparently atrocious bores so you don’t want to get stuck with them at a party or, for that matter, a Canterbury A&P Show. We were lurking outside the showground when we bumped into John Key – or more accurately, one of his security detail. “Running the country is his job,” said Andrew primly. I snorted. 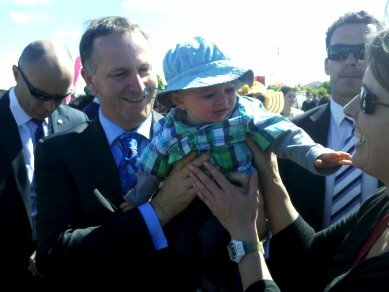 Well, John Key quite obviously wasn’t waiting on an imminent fax from Vladimir Putin; he also happened to be snogging a baby at that moment, which I felt somewhat undermined Andrew’s argument. FIRSTLY, John Key isn’t a celebrity; he’s a politician. Secondly, what makes New Zealand great is bungee jumping and Sauron The Dark Lord. And thirdly, these things make New Zealand really pretty awesome but hardly ‘great’. I’m not dissing my chosen home; it’s just that there are very few countries that qualify as ‘great’. In fact I can think of just two: The USA, due to its size and Davy Crockett; and England, because it says so in the title, but also because, you know, Genghis Khan. Husband eventually capitulated, mainly because I started whining and threatened to sulk. Johnny is SUCH a dude. No really; I like him. People were swarming around shoving their children at him – many with chocolaty hands – and although there was a touch of rigor mortis about his smile, it never faltered. He wasn’t that sweaty even though it was a hot, sunny day and he was stuffed into a suit. I had no intention of foisting my cranky, squirming progeny on him, but Johnny seized Finn and didn’t drop him once. He fully complied with my request to ‘show some teeth’. The highlight of the Royal New Zealand A&P Show in Christchurch yesterday was a widdle. Had it not been blowing a 100kph southerly with heavy showers, the outcome might have been different. Although the inclement weather was hardly the fault of the organisers, the abysmal organisation was. Signs for carparking were insufficient and inaccurate. The two officials we asked had never heard of goats, never mind where they were exhibited. I suppose the trading area was quite good. For a while, I wondered whether the contraption that picked up walnuts was the highlight of the show. I mean, it was admittedly INGENIOUS: a little wire ball at the end of a stick which you wheel about the ground, and IT COLLECTS WALNUTS (please note: there have to be walnuts on the ground to begin with). However, it seemed a bit . . . well . . . pointless. I mean, a device that picks up walnuts? You know, if it picked up – say – coins or spilt vodka, THEN I would have been impressed. The agricultural community is obsessed with peeling vegetables. There were at least five stalls devoted to the sale of vegetable peelers. I noticed that whenever one of these appliances was demonstrated, the potatoes used were fresh, large oval ones. To me, this constitutes an unfair and unusual advantage. Again, perhaps if demonstrators had used old, wrinkled, half-rotten spuds, the outcome would have been different. Now, it should be noted there were extenuating factors surrounding my trip to the loo. Even before I arrived at the show I needed to pee– and more after circling the show grounds twice trying to locate the members’ carpark. However, I was determined not to avail of the bathroom facilities typical of these types of events: the draughty plastic portaloos overflowing with fly-infested faeces, any evidence of toilet paper being plastered to the walls with some humanly derived substance. I knew I had enough willpower not to wee. However, four hours of exponentially increasing clenching was starting to make my teeth ache. I approached the portacabin with a sense of fatalism. And it was LOVELY! Carpeted floors that were almost clean; a light fragrance playfully redolent of Harpic; fully stocked toilet paper dispensers with smooth dispensing action; lashings of pink hand soap washed down with warm water. It was such an awesome experience, I went again half an hour later even though I didn’t need to. Mother-In-Law has no clothes dryer and only one set of bed linen. Therefore, laundering the sheets is conditional on the weather. She is specific about her requirements: light south westerly, bright sunshine, little to no cloud cover, 32+degrees, and a cast-iron guarantee that the given conditions will persist to late afternoon. She has to make her decision before 7am, because her washing machine takes about five hours for a cycle due to low water pressure. I suppose she must wash her sheets about once a year. In Oamaru yesterday, I passed a shop with a bargain bin full of bedlinen. Standing out amidst a truly startling selection of blood-quickening bedwear, was a set of royal-blue satin queen-sized bedsheets. Did I mention they were satin? However, the more I thought about it, the more I realised with a certainty and conviction atypical for me, that royal-blue satin queen-sized bedsheets were the only possible way to express my keen appreciation and gratitude to the Outlaws for putting me up for the last x months weeks. I took the sheets – secured with a matching satin ribbon – inside to pay. “Aren’t they LOVELY?” enquired the saleswoman. “Oh yes, it really stood out,” I said, grabbing my purchase and making a run for it. I called into a newsagents a few doors down to see if I could buy some matching wrapping paper. There was nothing bright enough – but I got something else. “Is there any chance I could wrap this here?” I asked, reluctantly setting the sheets on the counter. “Oh, my! Aren’t those GORGEOUS?” breathed the saleswoman.